Is there anything better than falling in love with a new book? How about falling in love with a whole new series? Well, here’s an awesome opportunity for you! Now you can get to know the New York Times and USA Today bestselling contemporary romance series by #1 NY Times Bestselling Author Barbra Freethy as part of a fun publicity event. 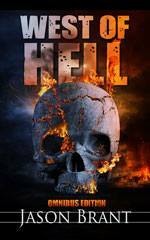 Each Callaway novel is filled with romance, suspense, and adventure. 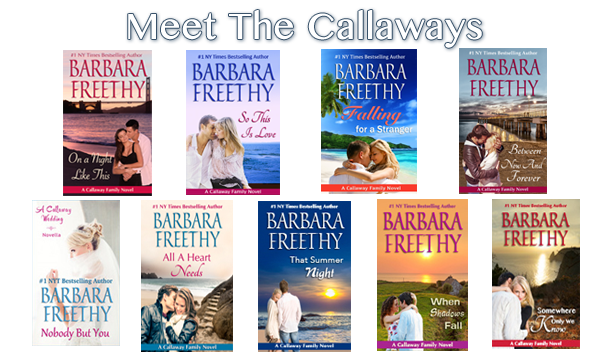 You can read all 8 books in the Callaway series for free (or, if you choose, you can give the series a try by reading just the first book, or you can host a guest post or interview instead—there’s lots of options). How cool is that?! The event will run from April 6 to April 11 and will celebrate the strong women in our lives with guest posts and interviews from the author, Callaway excerpts, and–of course–your reviews! We’ll have lots of prizes to give away too, including Amazon gift cards, autographed books, and Callaway swag! Don’t have time to read and review? That’s okay, you can still participate and compete for these awesome prizes by hosting a guest post, excerpt, or interview–but I hear you’re going to want to read all about the Callaways. Once you get started, it’s so hard to stop. The second oldest of the Callaway clan, Aiden Callaway veered from the family tradition of urban firefighting and became a smokejumper, never questioning his choice until the job took the life of his friend, Kyle, and left Aiden with injuries and fractured memories. Everyone blames Aiden for what happened, but he doesn’t remember, nor is he sure he wants to remember. The truth may clear Aiden of blame but destroy Kyle’s reputation and hurt the people he left behind. Sara had always been untouchable, sweet, innocent, his sister’s best friend, and the girl next door. But one reckless night in their youth took their relationship to a new level. Sara has never forgiven or forgotten the way Aiden brought it crashing down, but she’s no longer that girl with the crazy crush. She’s a woman in search of her own truth. ON A NIGHT LIKE THIS is the first book in an eight book connected contemporary romance series featuring the intriguing Callaway family. Love, mystery, adventure — the Callaways have it all! Barbara Freethy is a #1 New York Times bestselling author of 40 novels. Traditionally published for many years, in 2011 Barbara began self-publishing her backlist and has sold over 5 million ebooks and as of today she is the bestselling KDP Author of ALL TIME! 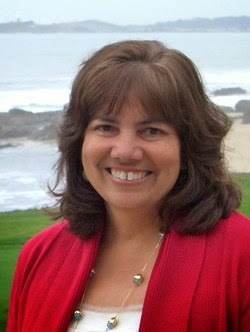 Nineteen of her titles have appeared on the NY Times and USA Today bestseller lists. Her book SUMMER SECRETS hit #1 on the New York Times and remained on the list for seven weeks. Posted on March 12, 2015, in BLOG TOURS and tagged author, blog, books, Novel Publicity, read. Bookmark the permalink. Leave a comment.